Gold (GLD) is consolidating after hitting a two-week high. Investors are witnessing renewed strength in precious metals after the Fed announced the expansion of Operation Twist until at least the end of the year. 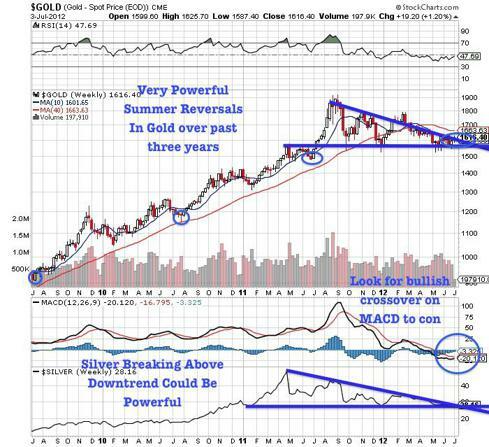 Similarly, gold and silver (SLV) have been recently moving higher based on the eurozone and stocks are breathing a sigh of relief as the summit came up with a purported solution to reduce funding costs, particularly for Italy and Spain, worth $149 billion. This may stimulate the eurozone. In addition, precious metal investors appear to be optimistic as the European Central Bank, Bank of England and the People's Bank of China concurrently ease interest rates to stimulate global growth in the depressed eurozone, which is experiencing record unemployment. So optimism is returning to Europe while the U.S., which has heretofore been a safe haven, is beginning to show signs that unemployment may be lurking higher. U.S. jobs data on Friday was lackluster. Weaker numbers going into the election could once again restart discussion of QE3. A possible coordinated stimulus by the ECB and China could be a catalyst for fund managers and traders returning from their 4th of July holiday vacation. This week should be quiet but next week could be exciting, especially if we witness this worldwide coordinated effort to stave off a pandemic meltdown before the 2012 U.S. presidential election. Over the past three years we have seen positive reversals in gold bullion in the summer months. The second half could represent an explosive move in the yellow metal as a coordinated worldwide stimulus begins. Nations such as Japan, EU, England and the U.S. are attempting to devalue their currencies in order to create growth and payoff soaring debts. Austerity is unpopular and the only solution is to continue to monetize the debt. Gold is regaining the 50-day moving average at $1600 and $1640 would be the next area of resistance. Traders are looking to see if silver gets to $29 regaining the 50-day moving average and breaking the four-month downtrend to the upside. Gold is moving into the favorable third quarter, which has proven the past three years to make powerful reversals higher. This may also benefit the wealth in the earth undervalued gold producers (GDX) and the bargain-priced junior explorers (GDXJ) which are hitting multi-year lows. In conclusion, increasing amounts of money is being printed worldwide. Inflation may be the only recourse for governments in trouble. We raise an unimaginable consideration. Could it be that the bankers and Federal Reserve Board eventually must devalue the dollar to keep pace with other nations to pay off soaring debts? We are fully aware that such a scenario might exist somewhere down the fiat paper road. Just a thought.